Robert Downey Jr. has to be one of my favourite actors at the moment. Did you see his acceptance speech at the Golden Globes? Hilarious! 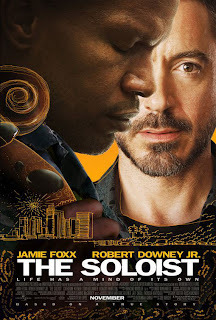 I never really pictured him to be in one of those true-story dramas where someone is helping out someone else in need, but The Soloist (2009), is exactly one of those films. Steve Lopez (Downey Jr.) is a Los Angeles journalist who stumbles across a homeless musician, Nathaniel Anthony Ayres (Jamie Foxx). Lopez decides to write a column about his encounters with Nathaniel, all the while trying to help him build a life instead of living out on the streets. Nathaniel wants to stay out on the streets, saying that it is 'safe' out there, and generally ignores Steve's help. Can Nathaniel still make it to the top in the music world, doing what he loves? Or will he just keep his life, homeless and playing for the people just passing him by? The Soloist is moderately heart-warming, but it is just really about Steve Lopez's selfishness which turns to selflessness. Jamie Foxx does surprise in his role, even touching on schizophrenia. Catherine Keener does provide a solid support role as Steve's ex-wife and boss. Joe Wright, the director of Atonement and Pride and Prejudice, makes a good effort at his first American film, but it is a shadow of how great Atonement was. This film should have been great, but it is a good enough watch which will earn it's place in your heart for a little while.